Hydromechanics, that branch of natural philosophy which treats of the mechanics of liquids, or of their laws of equilibrium and of motion. It includes the consideration of those molecular properties of liquids which affect their mechanical applications, such as fluidity and slight compressibility. The science which is here termed hydromechanics has been sometimes treated under the title of hydrodynamics, this being made to include hydrostatics and hydraulics, which is the nomenclature adopted by Sir David Brewster; while others treat of hydrodynamics and hydrostatics as two independent subjects, hydraulics being embraced by hydrodynamics; but the title hydromechanics which was adopted in the first edition of this Cyclopaedia seems to be the most comprehensive and exact, and will be retained. - Hydromechanics is comparatively a modern science, having received its greatest development in the 16th, 17th, and 18th centuries. The ancient mathematicians and hydraulic engineers, who constructed the aqueducts of Egypt and Assyria, must have been acquainted with many of the more obvious principles of hydraulics and hydrostatics; and at the time of the construction of the Roman aqueducts hydromechanics may be considered as having become entitled to be called a science; but the more purely mathematical principles by which its laws can be well understood were not discovered till centuries after. Some of the general principles which lie at the foundation of the science, and are susceptible of analytical and experimental demonstration, were first given by Archimedes in the latter part of the 3d century B. C.; and it is to him that we owe the demonstration of the fundamental principle of the equilibrium of liquids, that each particle in a liquid at rest receives equal pressure in every direction, and also that a solid immersed in a liquid loses an amount of weight equal to that of the water displaced, from which he deduced the method of obtaining the specific gravity of bodies. "We also owe to him the method of raising water by means of the screw known by his name. 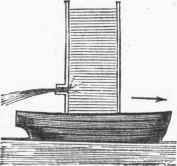 Other advances in the construction of hydraulic machinery were made about the same time in the Greek school at Alexandria by Ctesibius and Hero, who invented the syphon and forcing pump, and also the fountain known as Hero's; but their limited knowledge of pneumatics, and the imperfection in the machinery of those times, prevented them from bringing the force pump to anything like its present degree of efficiency. The first attempt at a scientific investigation of the motions of liquids was made by the consul Frontinus, who was inspector of the public fountains at Rome under the reigns of Nerva and Trajan, and whose book De Aquaeductibus Urbis Roma Commen-tarim, describing the nine great aqueducts of Rome, to which he afterward added five, contains all the knowledge of hydromechanics possessed by the ancients. From the statement of Pliny that water will rise to a level with its source, and that it should be elevated in leaden pipes, it appears that this metal was used by the ancient Romans for small conduits. Frontinus was the last of the ancients who paid much attention to the subject, the next investigator of importance being Stevinus, born about 1550, who was engineer of dikes for the government of Holland. He published a work in Dutch in 1586 on the "Principles of Statics and Hydrostatics," in which he restates the principle of Archimedes, and deduces from it the "hydrostatic paradox," that the pressure of a liquid on the bottom of a vessel may be much greater than its weight. By a method approaching the infinitesimal calculus, he found the pressure on the oblique bottom of a vessel; and Whewell remarks that his treatment of the subject embraces most of the elementary science of hydrostatics of the present day. Galileo, in his " Discourse on Floating Bodies " (1612), shows a clear knowledge of the fundamental laws of the science; but it is to his discovery of the uniform acceleration in falling bodies that we owe one of the chief foundations of hydromechanics. 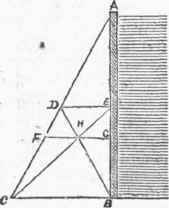 This law was afterward more fully applied by Torricelli in his celebrated theorem that the velocities of liquid jets are proportional to the square roots of the depths at which they issue below the surface, which he published at the end of his treatise De Motu Gravium naturaliter accelrato (1643). Pascal's work, written ten years later and published after his death, Sur Vequi-libre des liqueurs, in which he treats the subject in a more systematic manner than any previous writer, contains complete and elegant demonstrations of most of the principles of hydrostatics, but does not treat of the motions of liquids. The next great student of hydromechanics was Sir Isaac Newton, who investigated the subject of friction and viscosity in diminishing the velocity of flowing water, and also of the velocity of jets; but upon the latter point he fell into an error by supposing that the velocity with which water issues from an orifice is equal to that which a body would attain by falling through half the vertical distance between the surface of the liquid and the orifice. His subsequent discovery of the vena contracta modified his conclusions, but his theory of efflux is open to objections. He, however, investigated the subject of waves, one of the most difficult in the science of hydrodynamics, in a manner worthy of his genius. In 1738 Daniel Bernoulli published Hy-drodynamica, seu de Viribus et Motibus Flu-idorum Commentaria, in which he founds his theory of the velocity of the motion of fluids through orifices upon the supposition that the surface of a fluid which is discharging itself by an orifice preserves a level, and that if the liquid is divided into an infinite number of horizontal strata, all the points in these strata will descend with velocities inversely proportioned to their breadth, or to the horizontal section of the reservoir. 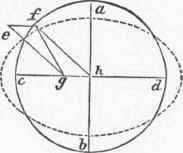 To determine the motion of each stratum, he employed the principle of "conservation of living forces;" and from the elegance of his solutions his work is pronounced by the abbe Bossut one of the finest productions of mathematical genius. But the uncertainty of the principle which he employed rendered the results of his work of less value than their mathematical excellence. The science afterward received the attention of D'Alembert and of Euler, who enriched it by the application of special mathematical methods of great acuteness and originality. The abbe Bossut also experimentally investigated the discharge of liquids by orifices, and added much to the stock of knowledge on the subject. To the experiments of Venturi, Eytel-wein, and others, the science is indebted for many facts in regard to the flow of water from conically diverging tubes. The flow of water over barrages has been from time to time investigated experimentally by the chevalier Dubuat, D'Aubuisson, Castel, and M. Prony, and also by Smeaton, Brindley, Robinson, Evans, Blackwell, and others. - Before considering the separate branches of the subject, we will notice two important physical properties of liquids, as upon them the action of hydrostatic and hydraulic forces depends. The first important property of a liquid is the perfect mobility of its particles over each other, and one which results from their slight cohesion. That there is a certain degree of cohesion is shown by the fact that liquids will form drops. There is no active repulsion between the particles until they have been heated to a certain degree; or the repulsion, if there is any, on the hypothesis that both forces are always in action, is less than the cohesion. A certain degree of cold, varying with the liquid, will cause an increase of the cohesive force, so that the liquid will become viscous and then solid; and it is found that the fluidity of a liquid is promoted by heat, and that water when cold will not flow through pipes as rapidly as when warm. The second important physical property of liquids is their great resistance to compression, so that for a long time it was doubted whether water was compressible. The experiment of Bacon, who hammered a leaden vessel filled with water till it was forced through the pores of the metal, was cited as a proof of the incompressi-bility of water; but a remark of Bacon's to the effect that he estimated the diminished space into which the water was driven, indicates that he drew a different conclusion. The experiment of the Florentine academicians in forcing water in a similar manner through the pores of a silver vessel was for some time regarded as indisputably establishing the incom-pressibility of water; but the apparatus devised by Oersted proves in a conclusive manner that water and all other liquids are slightly compressible. Canton had previously shown that liquids were compressible, but the degree could not be ascertained with any accuracy in consequence of the difficulty of determining the amount of expansion which had been produced in the containing vessel. This was obviated by Oersted in placing it within another, so that it would receive equal pressure upon equal surfaces without and within, and thus preserve a uniform capacity. His apparatus is shown in fig. 1. The liquid to be subjected to pressure is placed in the inner glass vessel a, from the top of which a capillary tube turns downward, its open extremity dipping beneath the surface of a layer of mercury contained in the bottom of the outer vessel. Another tube, ft, graduated and used as a manometer, also open at the lower end and dipping in the mercury, is placed along with the vessel a in a strong glass cylinder, which is provided at the top with a smaller metallic cylinder which admits the compressing screw c, and also a funnel, d, for introducing the liquid. 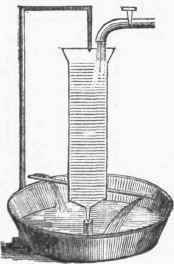 The vessel a with its capillary stem, having been filled with the liquid, is placed in position, together with the manometer; the outer cylinder is filled with water, the stopcock of the funnel closed, and pressure produced by turning the screw with a lever. Mercury will be seen to rise in the capillary tube connected with the vessel a, showing that its contents are diminished in volume. The air contained within the manometer, being reduced in bulk in proportion to the force exerted, according to the law of Boyle and Mariotte, will therefore be a measure of that force. Oersted at first assumed that the external and internal pressure on the vessel was precisely the same; but the external pressure is slightly the greater, because the external surface is greater than the internal, so that the capacity of the vessel is diminished, instead of being increased as in all preceding experiments. 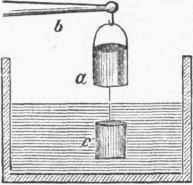 Colladon and Sturm with the use of this apparatus made very exact experiments, in which they calculated the change of capacity of the vessel a, and estimated that an additional atmospheric pressure would reduce the volume of water .00005, mercury .000005, and sulphuric ether .000133. For water and mercury it was found that within certain limits the decrease in volume is proportional to the pressure. I. Hydrostatics. In consequence of the mobility of the particles of a liquid over each other, they yield to the force of gravity, and consequently when at rest present a level surface; and for the same reason each particle, and therefore each portion of the liquid, must exert and receive equal pressures in all directions. If this were not true, the particles of a liquid could not come to a state of rest. From this principle it follows that equal surfaces of the sides of a vessel containing a liquid receive equal pressures at equal depths below the surface; and also that if a close vessel is filled with a liquid which we will suppose to have no weight, and if an aperture of the size of one square inch be made in one side of it and fitted with a piston upon which there is exerted a pressure of 10 lbs., there will also be exerted the same pressure of 10 lbs. upon every square inch of the internal surface of the vessel. Consequently, if another aperture of 100 square inches area is made in the side of the vessel, and a cylinder of the same size is fitted to it, a piston fitted to this will receive a pressure of 1,000 lbs. 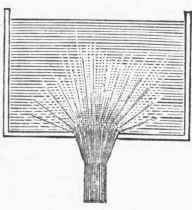 Upon this principle (which has been ascribed to Pascal, but which, as we have seen, was before his time explained by Stevinus) the hydraulic press is constructed, as represented in fig. 2. A suction and force pump, a, supplied from the cistern B, forces water through the tube C into the strong cylinder V, which communicates pressure to the piston A. The power gained is the proportion which the cross section of the large piston or plunger bears to the small one. It will be observed that the pistons do not fit the cylinders in the usual manner, but only fit tightly at the collar. 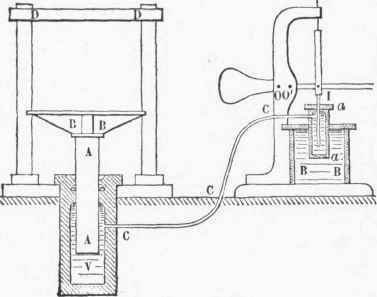 This mode of construction greatly increases the efficiency of the machine, which, though described by Stevinus and by Pascal, remained practically useless in consequence of the escape of water between the cylinder and the piston, until Bramah invented the cupped leather collar, which makes the apparatus equally water-tight under all pressures. This engine is a good illustration of the law in mechanics that "what is lost in velocity is gained in power." If the cross section of the large piston is equal to 100 square inches, and that of the small piston to 1 square inch, the latter must be moved through a space of 100 inches to cause the large piston to move through one inch, but it will move with 100 times as much power as the small one. 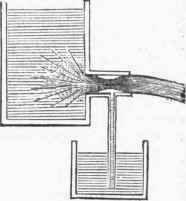 The hydrostatic bellows, shown in fig. 3, acts upon the same principle as the hydrostatic press, the cover of the bellows, upon which the weight is placed, performing the office of the large piston, while the column of water in the tall vertical pipe acts the part of the small piston of the press. The hydrostatic bellows also illustrates the principle of the hydrostatic paradox, for the vertical pipe and the bellows are virtually one vessel, whose base is the bottom of the bellows. Now the pressure exerted by the liquid in the pipe upon the upper plate of the bellows is received by the lower plate, which also has an additional pressure equal to its distance below the upper plate; and if the water in the pipe is ten times as high as that in the bellows, it follows that the pressure on the bottom plate will be ten times as great as that which would be produced by the liquid contained within the bellows itself, for that only is equal to its own weight. If a barrel of water therefore have a tall tube inserted in one head and standing vertically, a pressure may be produced on its bottom several thousand times that due to the weight of the water alone. In accordance with this law of hydrostatic pressure, a liquid will rise to the same height in different branches of the same vessel, whether these branches be great or small. 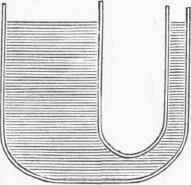 Thus, water contained in the U-shaped vessel, fig. 4, will rise to the same height in both branches, which is an illustration of the principle that the pressure of a column of liquid is in proportion to its height and not to its quantity. This principle, however, if it is entitled to such a name, proceeds directly from the principle of Archimedes that each particle in a liquid at the same depth receives an equal pressure in all directions. If however one leg of a U-shaped tube contain mercury and the other water, the column of water will stand 13 1/2 times as high as that of mercury. It follows from the fact that a liquid presses equally upon equal areas of a containing vessel at the same depth, that if a hole is made in one side of a vessel, less pressure will be exerted in the direction of that side; and therefore if the vessel is floated on water, as in fig. 5, it will be propelled in the direction of the arrow. Fig. 1. - Oersted's Apparatus. Fig. 2. - Hydraulic Press. Barker's centrifugal mill, a small model of which is shown in fig. 6, acts upon the same principle of inequality of pressure on opposite sides. The propelling force has been ascribed to the action of the escaping liquid pressing against the atmosphere, by which a corresponding reaction is obtained; but if the machine is placed in a vacuum, it will rotate with greater velocity than in the open air, which proves that the propelling force is the preponderance of pressure in one direction. The two following are important laws of hydrostatics: 1. The hydrostatic pressure against equal areas of the lateral surfaces of cylindrical or prismoid vessels, commencing from the surface of the liquid, varies as the odd numbers 1, 3, 5, 7, etc. 2. The hydrostatic pressure against the entire lateral surfaces of cylindrical or prismoidal vessels is proportional to the square of the depth. The first law is demonstrated as follows: Hydrostatic pressure in any direction at any point in a liquid is in proportion to the depth, a result due to the action of gravity; therefore the mean pressure against any rectangular lateral area will be on a horizontal line midway between the up-per and lower sides of such area. The depth of this line, proceeding from the surface of the liquid downward, varies as the odd numbers 1, 3, 5, 7, etc, as will be seen by an inspection of the adjoining diagram, fig. 7. The figures placed upon the dotted lines in the centre of the areas indicate the pressures upon those lines, and also the proportional pressures against those areas. The figures on the right side of the diagram indicate the pressures at points of equal vertical distances, while those upon the left indicate the total lateral pressures, which it will be observed are the squares of the number of areas included; by which is demonstrated the second law, that the total lateral pressure against rectangular areas is in proportion to the square of the depth. The weight of a cubic foot of water is 62.5 lbs. ; therefore the lateral pressure against a surface of a square foot, whose upper side is in the surface of the liquid, is 31.25 lbs. From this it is easy to ascertain the pressure against a square foot, or any area, at any depth below the surface. Simply multiplying the number of feet below the surface by 2 and subtracting 1, multiplying the remainder by 31.25 and this product by the number of horizontal feet, will give the pressure of a stratum of water a foot deep, at any depth below the surface and of any length. To ascertain the entire pressure against the sides of a vertical cylindrical or prismoidal vessel, square the depth of the liquid in feet or inches, and multiply this by the lateral pressure against an upper vertical square foot or inch, as the case may be, remembering that the weight of a cubic inch of water is .5792 of an ounce, and therefore that the pressure against an upper lateral side is .2896 of an ounce. The total pressure exerted against the sides of a cylindrical pipe 60 ft. high and 2 in. in diameter is found as follows: 602x31.25= 112,500. The diameter of the pipe being 2 in., the circumference of the inner surface is 2 x 3.141592 (the constant ratio) = 6.283184 in., or 6.383184/12 of a foot. Therefore, 112,500 x 6.283184/12= 58,904.92 lbs. or 29.95 tons. The lateral pressure on the lower foot would be (60x2) - l = 119 x 31.25 x 6.283184/12=1959.64 lbs., or a little less than one ton. In the construction of walls for resisting only the hydrostatic pressure of water, as that pressure is in proportion to the depth, the strength of the wall should be in the same proportion. If strength were not given to the lower layers by superincumbent pressure, the inclination of the slope should be 45°; but in consequence of this pressure it may be less, varying with the materials and their manner of being put together. In the construction of dams or barrages the varying circumstances of cases allow of the display of a good deal of engineering skill. A barrage suitable for restraining a body of water which is never strongly moved in a lateral direction against it, as at the outlet of a canal or a reservoir fed by an insignificant stream, would not be adapted to a mountain torrent, where the surface of the reservoir can scarcely ever be large enough to prevent, by the inertia offered by a large mass of water, the walls from being subjected to a strong lateral force from the action of the current. Under such circumstances it is usual to give a curved surface to the facings, in a vertical as well as in a horizontal direction; the curves in both directions being calculated from the following elements: 1, the ascertained hydrostatic pressure; 2, the nature of the materials, such as the weight of stone and tenacity of the hydraulic cement used; and 3, an estimate of the maximum force of flowing water which may at any time be brought against the structure during a freshet. This force, it will readily be seen, will have a different direction and a different point of application in different cases, depending upon the depth and extent of the reservoir. The top of the dam is therefore given a greater horizontal section than would be called for if hydrostatic pressure alone had to be opposed. The hydrostatic pressure at any point against the surface of a containing vessel is the resultant of all the forces Collected at that point, and is therefore at right angles to that surface. In a cylindrical or spherical vessel these resultants are in the direction of the radii, and in the sphere vary in direction at every point - Centre of Pressure. The centre of pressure is that point in a surface about which all the resultant pressures are balanced. The cases are innumerable, and often require elaborate mathematical investigation. The simplest case and its general application only will be considered here, viz., that of the centre of pressure against a side of a rectangular vessel. Let any base in the triangle ABC, fig. 8, represent the pressure at B; then will DE represent the pressure at E, and all lines parallel to it will represent the pressures at corresponding heights. The finding of the centre of pressure now consists in finding the centre of gravity of the triangle ABC, which will be at H, the intersection of the bisecting lines E C and D B, and at one third the height of the side A B; consequently the centre of hydrostatic pressure against the rectangular side A B is at G, one third the distance from the bottom to the surface of the liquid. The average intensity of pressure against A B being at E, one half the depth of A B, therefore the total pressure on the rectangular side A B will be the same as if it formed the bottom of the vessel and was pressed upon by a column of water of half the depth of A B. In general, the total pressure on any surface, plain or curved, is equal to the weight of a liquid column whose base is equal to that surface, and whose height is the distance of the centre of gravity of the surface from the surface of the liquid. - Principle of Archimedes. A solid immersed in liquid loses an amount of weight equal to that of the liquid it displaces. This is called the principle of Archimedes, and is demonstrated as follows: Let a b, fig. 9, be a solid immersed in a liquid. 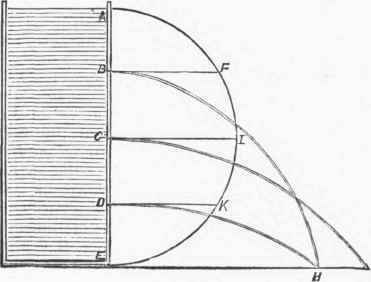 The vortical section c d will be pressed downward by a force equal to the weight of the column of water e c, and it will be pressed upward by a force equal to that exerted by a column of water equal to e d; therefore the upward or buoyant pressure exceeds the downward pressure by the weight of a column of water equal to the section c d. Now, this section also exerts a downward pressure; and if the body is denser than the liquid, the downward pressure will be greater than the excess of the upward pressure of the liquid, and the body will sink if not supported; but if the body is less dense than the liquid, the downward pressure of the column e d will be less than the upward pressure exerted against it, and the body will float. This principle may be experimentally demonstrated by the hydrostatic balance, fig. 10. From a balance, b, is suspended a cylindrical vessel, a, from which again is suspended a solid cylinder, c, which is of such bulk and dimensions as just to fill the vessel a when introduced. The whole system is first balanced by weights at the other end of the beam, and then c is immersed in water. The equilibrium will be destroyed, and that the body c loses a portion of its weight equal to that of an equal bulk of water is proved by filling the vessel a with water, when the equilibrium of the balance will be restored. It is by means of a similar apparatus that the specific gravities of solids is ascertained (see Gravity, Specific); and upon the principles already laid down hydrometers, or instruments for ascertaining the specific gravity of liquids, are constructed. (See Hydrometer.) It is thus also shown why it is easier to raise weights in water than in air, and why fat persons sustain themselves in water more easily than those who are lean. The air bladder in fishes is for the purpose of enabling them to rise or descend in the element in which they live. This rise and fall by varying the specific gravity is beautifully illustrated by means of the little toy called the bottle imp or Cartesian diver, fig. 11. A bottle is nearly filled with water, and a hollow image of glass or metal and lighter than water, or several little balloons of glass, each of them having an opening below through which water may flow in and out, are introduced into the bottle or jar, which then has its mouth covered with a sheet of caoutchouc, or some elastic membrane. Pressure upon this will compress the air beneath it, and to the same degree the air which is contained in the upper part of the image or the balloons, so that their specific gravity is increased enough to make them sink. Removal of pressure will allow the confined air to resume its former bulk, by which the specific gravity will again become less than that of the water, and they will again ascend. If their surfaces have oblique or spiral directions, and the air is properly distributed, the images may be made to perform various curious evolutions. - Stability of Floating Bodies. There are certain points to be observed in determining the stability of floating bodies; these are: 1, the centre of gravity of the floating body; 2, the centre of buoyancy; and 3, the metacentre. When a body floats upon water it is acted On by two forces: 1, its own weight, acting vertically downward through its centre of gravity; 2, the resultant force produced by the upward pressure of the liquid, which acts through the centre of gravity of the fluid that is displaced, which point is called the centre of buoyancy of the body. It follows, therefore, that these two points, the centre of gravity and the centre of buoyancy, must be in the same vertical line for the body to be in a state of equilibrium; for otherwise the two forces, one acting downward and the other upward, would form a couple which would cause the body to turn. When these two centres are in the same vertical line, but the centre of gravity is above, the body, except in some cases to be noted presently, is in a state of unstable equilibrium; but when the centre of gravity is beneath, the body is in a state of stable equilibrium. If a body is floating in a liquid and is entirely immersed, it will not come to a state of stable equilibrium until the centre of gravity is vertically below the centre of buoyancy. This is shown in fig. 12, in the case of bodies which are less dense at one end than at the other, where B and B' are the centres of buoyancy and G and G' those of gravity. But in many cases, when a body is only partially immersed, the centre of gravity may be above that of buoyancy, and yet the action of turning cannot take place, so that a condition of stable equilibrium will be attained under these circumstances. If a flat body, such as a light wooden plank, is placed in water, it will float, and a portion will be above the surface, as shown in fig. 13; and therefore, if the centre of gravity is not below the centre of volume, it will be above the centre of buoyancy, and yet the body will be in a state of stable equilibrium. For if it be tipped as represented in fig. 14, the centre of buoyancy will be brought to the position B', on the depressed side of the vertical passing through the centre of gravity, and this will cause the body to return to its former position. But if the body has such a shape that when it is displaced the centre of buoyancy is brought to that side of the vertical passing through the centre of gravity, which is elevated as represented in fig. 15, then the body will turn over. When the body is in the new position, a vertical drawn through the. changed position of the centre of' buoyancy will intersect the line which in the first position passed vertically through the centre of gravity, and this point of intersection is called the metacentre, represented at M in figs. 15 and 16. When the metacentre is above the centre of gravity, as in fig. 16, the body will tend, by the action of the centre of buoyancy, to return to its former position; but when it is below, as in fig. 15, the action of the centre of buoyancy, being upward on the elevated side, will tend to turn the body over. Its proper place therefore, as its name would indicate, is above the centre of gravity, but it cannot be a fixed point. In all well built ships, however, its position is pretty nearly constant for all inclinations. For example, in fig. 16, as long as increase of inclination of the vessel carried the centre of buoyancy B to the left, the point M might remain at nearly the same distance from G, because it would also move to the left. But if the inclination of the vessel in the same direction carried the centre of buoyancy to the right, the height of the metacentre M would diminish until it would be in G, when the equilibrium would be indifferent, and at last below G, when the ship would turn over. It is desirable to have the metacentre as far as possible above the centre of gravity, and this condition is secured by bringing the centre of gravity to the lowest practicable point, by loading the ship with the heaviest part of the cargo nearest to the keel, or by employing ballast. II. Hydrodynamics, although it embraces many of the principles of hydrostatics, treats more particularly of the laws of liquids in motion. One of the most important principles of hydrodynamics is that which determines the velocity of jets which issue from orifices at various depths in the sides of vessels containing liquids, and depends upon the laws of hydrostatic pressure. If an orifice is made in the side of a vessel containing a liquid, the liquid will issue from it with a velocity equal to that which a heavy body would acquire in falling through the vertical distance between the surface of the liquid and the orifice. If the jet is directed upward, it will ascend, theoretically, to a level with the surface of the liquid; but practically it will fall short of this in consequence of friction at the orifice, and of the resistance offered by the air. At first sight it would appear that the velocity of efflux would be proportional to the pressure, but an analysis of the case, aside from the test of experiment, will show that this cannot be, for in no instance can the jet be projected higher than the surface of the liquid. If, in general terms, the velocity of a jet were in proportion to the pressure at the point of issue, a column of mercury would throw a jet with 13 1/2 times the velocity that an equal column of water would; but it must be perceived that a column of mercury can only propel a jet as high (theoretically) as the surface, and therefore to the same height as an equal column of water can. Now, there can be no doubt that the pressure of mercury at the same depth is 13 1/2 times that of water; but mercury, being also 13 1/2 times as heavy as water, has 13 1/2 times as much inertia, and therefore requires so many times as much force to give it the same initial velocity. The velocity with which a liquid escapes from an orifice varies as the square root of the depth below the surface; so that when the points of escape are 1, 4, 9, and 16 ft. in depth, the initial velocities will be as 1, 2, 3, and 4. This is the celebrated theorem of Torricelli, which he deduced from the laws of falling bodies. As the velocity of a falling body is in proportion to the time of its fall, it will be in proportion to the square root of the height fallen through, and is represented by the formula V = √2gh, in which g is the accelerating force of gravity (= 32.2), and h the height. (See Mechanics.) A jet issuing from the side of a vessel describes, theoretically, a parabola, precisely as in the case of a solid projectile; for the impelling force and the force of gravity act upon the jet in the same manner, and the resultant force gives it the same direction. The range, or distance to which the jet is projected, is greatest when the angle of elevation is 45°, and is the same for elevations which are equally above or below 45°, as 60° and 30°. The resistance of the air however alters the results, and the statement is only true when the jet is projected into a vacuum. If a vessel filled with water have orifices made in its side at equal distances in a vertical line from the top to the bottom, a stream issuing from an orifice midway between the surface and the bottom will be projected further than any of the streams issuing from the orifices above or below. This may be demonstrated by the adjoining diagram, fig. 17. Let a semicircle A F E be described on the side of a vessel of water, its diameter being equal to the height of the liquid. The range of a jet issuing from either of the orifices B, C, or D will be equal to twice the length of the ordinates B F, CI, or D K respectively; and therefore jets issuing from B and D will meet at a point H on a level with the bottom, and twice the length of the ordinates B F and D K. Now, as the ordinate CI is the greatest, the range of the jet issuing from C will be greater than that of any other jet. The amount of water escaping in one second from an orifice would, theoretically, be equal to a cylinder having a diameter equal to that of the orifice, and a length equal to the distance through which a body will move with a uniform velocity after it has fallen through a height equal to the vertical distance between the surface of the liquid and the orifice. If this distance is 16.1 ft., the velocity acquired will be 32.2 ft. per second, and therefore the theoretical quantity discharged from an orifice 4 in. in diameter, whose centre is 16.1 ft. below the surface, would be equal to a cylinder 4 in. in diameter and 32.2 ft. long, and containing 4,828.5 cubic inches, or about 21.83 gallons. The actual discharge from a thin orifice not furnished with an ajutage is however much less, being only about two thirds of the theoretical amount. The loss is owing partly to friction, but mainly to the interference of converging currents moving within the vessel toward the orifice. This interference may be shown by employing a glass vessel having a perforation in its bottom, as represented in fig. 18. If particles of some opaque substance having nearly the same specific gravity as water, so that they will remain suspended in it for a space of time, be mingled with the water, they will be seen, to move in the direction indicated by the lines in the figure, which are nearly direct. If the jet is carefully observed, it will be seen that it is not cylindrical, and that for a distance from the orifice of about half its diameter it resembles a truncated cone with the base at the orifice. This contraction of the stream is called the vena contractu, and its smallest diameter is stated to be from 0.6 to 0.8 of that of the orifice. When the stream has a direction downward nearly vertical, it continues to diminish beyond the vena contracta, in consequence of the increased velocity caused by the force of gravity, the size being in the inverse proportion to the velocity. The increased velocity at the vena contracta is due to the pressure which forces the particles of water into a narrower channel. As the jet continues to fall, it forms a series of ventral and nodal segments, as shown in fig. 19. The ventral segments are composed of drops elongated horizontally, as shown at a a, while the nodal segments are elongated vertically, as seen at b b; and as the segments have fixed positions, it follows that the drops in falling are alternately elongated vertically and horizontally. If the orifice is in the side of the vessel and discharges horizontally, the size of the stream does not diminish in the same manner as when falling vertically, and it is sooner broken. If a cylindrical tube or ajutage whose length is from two to three times its diameter is fitted to the orifice, the rate of efflux may be increased to 80 per cent. of the theoretical amount. The velocity will be somewhat diminished, but the vena contracta will be larger in proportion. If the inner end of the ajutage has a conical shape with the base toward the interior, the efflux may be further increased to 95 per cent. ; and it has been found that if the outer end of the tube is also enlarged, the efflux may be still further increased to very nearly the theoretical amount, say 98 per cent. When a cylindrical ajutage is used, there will be a partial vacuum formed between the sides of the tube and the contracted vein, as shown in fig. 20. If a pipe ascending from a reservoir of water is let into this part of the ajutage, the water will rise in the pipe; and if the height is not too great, the vessel may be emptied. - The resistance offered by conduits is a subject of great importance in practical hydromechanics, upon which extended experiments have been made. When the length of the ajutage bears more than a certain proportion to its diameter, the efflux is reduced to about the same amount as when the stream issues through a thin orifice, that is, about 62 per cent. of the theoretical amount. With a pipe of 1 1/8 in. in diameter and 30 ft. long, the efflux will be only about half that from a thin orifice, or 31 per cent. of the theoretical amount. This reduction is caused by friction between the liquid and the tube, as well as between its particles, and is greater with cold than with warm liquids. This resistance to motion, or approach to rigidity, which is conferred by cold, is called viscosity, and is a principle which has to be taken into account in nearly all very careful hydraulic calculations. - Resistance'of'Liquids to the Motion of Solid Bodies. This will depend upon the form and size of the body. The following are two important laws: 1. With the same velocity, the resistance is proportional to the extent of surface applied by the solid to the liquid in the direction of motion. 2. With the same extent of surface, the resistance is proportional to the square of the velocity. These laws may be demonstrated experimentally, but their truth will also be apparent from the following considerations. In regard to the first law, it will be easily understood that with the same velocity the amount of water displaced will be the measure of resistance, and that a surface of two square feet will displace twice as much as one of one square foot. The second law is not so evident, but will be made clear by considering that with a given surface, when the velocity is doubled, twice the quantity of liquid will move through twice the space in the same time, and will therefore, according to the principles of mechanics, have a fourfold momentum. The resistance, therefore, offered to a plane surface moving, at right angles against a liquid, is measured by the area of the surface multiplied into the square of the velocity. It has been found that a square foot surface, moved through water with a velocity of 32 ft. per second, meets with a resistance equal to a weight of 1,000 lbs. When the motion of a body in a liquid is very slow, say less than 4 in. per second, depending on the size of the body, the larger body requiring to move more slowly, the above laws are not rigidly followed, but the resistance is divided into two components, one of which is proportional to the simple velocity, and the other to the square of the velocity. The most accurate results in experimenting with slow motions were obtained by Coulomb, who used his torsion balance. One of the most interesting problems in mathematics has been to determine the form of a solid which will meet with the least resistance in moving through water. This form is called the "solid of least resistance," and is approached as near as practicable in the construction of ships. - Theory of Waves in Liquids. "When a pebble is dropped into still water, a series of circular waves is formed upon its surface, which extend themselves from the centre in all directions. These waves consist of alternate elevations and depressions, which have the appearance of following one another in the direction of the radii of the circle. It is however only an appearance, as may be readily proved by throwing a cork upon the undulating surface, when it will be observed only to rise and fall, and the undulations will appear to glide beneath it. The wave then is an oscillation of the liquid upward and downward, and the force which causes it is gravity. The pebble when it strikes the water displaces a portion, which rises on every side to a certain height, and then, its momentum being lost, and being higher than any portion of liquid around it, it falls; but the momentum it has acquired carries it below the level, and an exterior ring is forced upward, which in descending also produces a successor; and thus a series of circular waves is formed of gradually diminished height but of increased diameter, until, at a very great distance in calm water, the force of the primary impulse is lost. When two waves proceeding from different centres meet one another in such a way that the elevations coincide, a united wave will be produced having a height equal to that of its two components, and a depression equal to that of the other two; but if the elevation of one corresponds to the depression of the other, the resulting elevation and depression will be equal to the difference of elevation and depression respectively of the original waves. If they are equal, the result will be the obliteration of both. This phenomenon is called the interference of waves. It is susceptible of demonstration that the undulations of waves are performed in the same time as the oscillations of a pendulum whose length is equal to the distance between two eminences, or the technical •breadth of the wave. - Form of Surface of Rotating Liquid. From the principle of the equilibrium of fluids, that the surface of the liquid at rest must be a level which is perpendicular to the direction of the force of gravity, it follows that when two or more forces act upon a liquid to change the position of its surface, the resultant of these forces will be perpendicular to the surface. Therefore, if a cylindrical or conical vessel, fig. 21, containing a liquid, is rotated on its axis A B, all the particles on the surface will be acted upon by two forces, that of gravity, in a vertical direction represented by A C or C E, and the centrifugal force, represented by C D or E F, which is horizontal, and varies in intensity with the distance of the particles from the axis or centre of motion. The surface of the liquid will therefore be depressed in the middle, and will be at every point perpendicular to the resultants AD, C F, etc, which will therefore be normals; and it may be demonstrated that the subnormals A C, C E, etc, are equal, and therefore that the surface of the liquid is a paraboloid. - A Level Surface. Let it be assumed that if the earth were entirely covered with water, and at rest, with no force acting upon the water except gravity, it would have the form of a perfect sphere. But it has been found to have the form of an oblate spheroid, the ratio of its polar to its equatorial diameter being about 299 to 300. Its oblate form is caused by its rotation on its axis. Let abed, fig. 22, be the section of a liquid sphere, passing through its axis of rotation a b, and let f be any point on its surface. The revolution of the sphere on its axis will generate a centrifugal force in the direction of f e, parallel to the plane of the equator c d, and perpendicular to the axis a b. Now, if f h represent the force of gravity and f e the centrifugal force, f g will represent the resultant of these two forces, and the surface of the liquid, being free to move, must become perpendicular to this resultant at every point. The surface of a revolving body, like the earth, if covered with a liquid, would have a form like that represented in section by the dotted line, and it may be demonstrated that this form is that of a spheroid formed by an ellipse revolving about its minor axis. Its surface, to which that of the earth approaches, is called a level surface. Fig. 8. - Centre of Pressure. Fig. 9. - Principle of Archimedes. Fig. 10. - Experimental Verification of the Principle of Archimedes. Fig. 18. - Vena Contracta.